The star will soon be in theaters delivering his take on an "Aladdin" character made famous by the late comedy legend, and he knows expectations are running high. Disney's highly anticipated live-action version of "Aladdin" hits theaters in May, but before moviegoers get lost in a whole new world of adventure, one of the stars is taking time out to honor an icon who came before him. 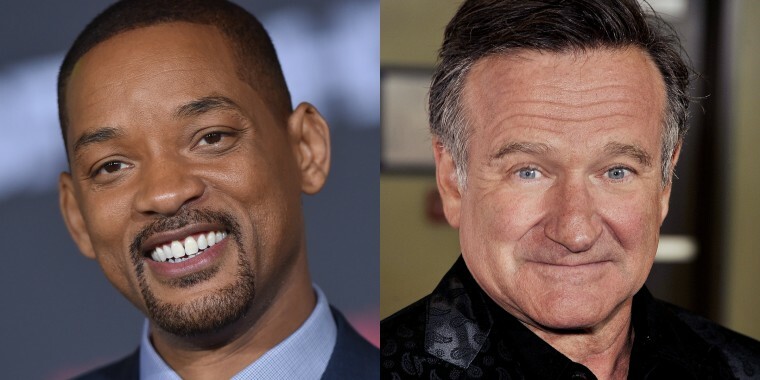 On Monday, Will Smith paid tribute to Robin Williams for the late actor's interpretation of a fan-favorite character 27 years ago — one that Smith will soon be famous for, too. That sweet — and very true — sentiment accompanied an illustration by character designer and concept artist Luigi Lucarelli that showed what an animated rendition of Smith's Genie might look like alongside Williams' classic big blue guy. Smith shared that image and message on Instagram just hours after the first full-length trailer for the film dropped. The actor posted the clip for his fans and followers and revealed that he's seen even more of the movie — in fact, he's seen it all. His verdict? "IT IS FIRE. I AM HYPED!!!" Here's hoping fans will be equally delighted when "Aladdin" opens in theaters nationwide May 24.